The arms trade, in which Prime Minister Malcolm Turnbull wants Australia to play a leading role, is fraught with strategic and ethical dilemmas which have caught us out in the past. We need to learn the lessons that history offers. Turnbull’s talk of jobs is not backed up by the evidence. The United Nations Charter, to which Australia is committed, begins “We, the peoples of the United Nations, determined to save succeeding generations from the scourge of war…”. Article 26 refers to “the establishment and maintenance of international peace and security with the least diversion for armaments of the world’s human and economic resources…”. Australia is therefore committed to the minimising of global weapons acquisitions, while Turnbull has just committed the country to what appears to be a contradictory goal, maximising our weapons exports. When the goals of arms restraint and commercial interests clash, as they inevitably will and probably often, history indicates that commercial interests are likely to win out. Even a cursory look at the history of the arms trade is replete with examples of its unintended consequences: the arming of dictators, the fuelling of tensions and the souring of international relations. In 1988 Minister for Defence Kim Beazley liberalised Australia’s arms exports guidelines, with the result that Indonesia, Bangladesh, South Africa, Myanmar, Sri Lanka and the Philippines were all significant buyers of Australian arms in 1989-90, despite all being accused of serious human rights abuses. In 1990, Australia’s surplus Mirage fighters were sold to Pakistan, a move that added to the tension in the South Asian region, elicited a hostile response from India and jeopardised our much larger trade with that country. Minister for Foreign Affairs Gareth Evans, subsequently seeking to mend the rift with India, commented that the policy of expanding our weapons exports created “an endless quagmire of difficulties and sensitivities”. That lesson appears lost on both Labor and the Coalition. In May 1990, export approval was given for the sale of trainer engine parts to Iraq; the sale was abandoned only when UN sanctions were announced. In August 1990, Iraq invaded Kuwait. Saddam Hussein had received approximately $48 billion worth of weapons during the 1980s, most of it from the US, the USSR, the UK, France and China. Many of the companies involved armed both sides in the Iran-Iraq war. 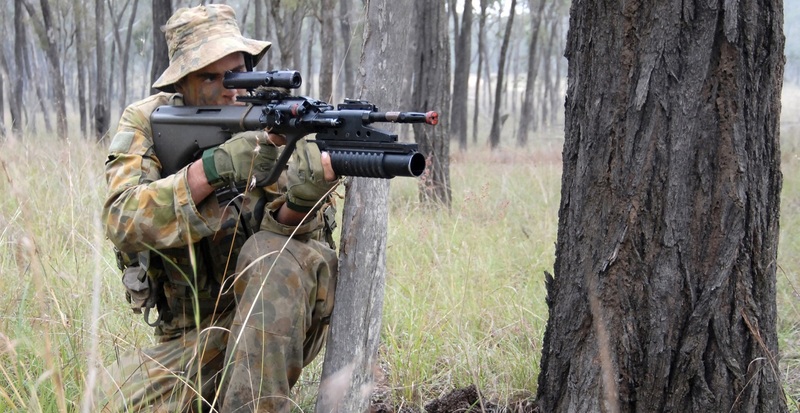 The optimists and the ostriches might argue that this time will be different, and Australian sales will not descend to the murky standards of the global arms trade. Minister for Defence Industry Christopher Pyne assures us that export permits will fulfil “the most stringent requirements”. Presumably these are the same requirements that allow sales today to that great bastion of democracy and human rights in the Middle East, Saudi Arabia; Saudi bombing is contributing greatly to the humanitarian crisis in Yemen. One might also argue that it is only by being heavily armed that we can deter aggression and avoid wars. While that notion is fairly easily debunked by a glance at the Middle East, a region that is both awash with weapons and plagued by wars, or at the US, which outstrips every other country in military spending by a huge margin and is virtually never at peace, we should reflect also on the history of the much-commemorated World War I. In the two decades before the Great War, Europe and the world spent vast sums on armaments—that were meant to secure and deter. A vast raid on the public coffers took place, enriching fragments of the economy, and robbing the rest…. As tensions again rise in several regions of the world, there is an urgent need to reduce rather than augment the pattern of armed preparedness that was so catastrophic a century ago. Talk of a ‘peace dividend’ after the end of the Cold War didn’t factor in a rapacious weapons industry for which such a thing was an anathema to be thwarted at all costs. William Hartung’s book, Prophets of War: Lockheed Martin and the Making of the Military-Industrial Complex, records that in 1996 Lockheed Martin engaged in a series of “defence-planning” seminars for officials in Poland, Hungary and the Czech Republic, as part of a very thinly-veiled marketing pitch for F-16s. They included maps of hundreds of enemy fighter planes and missiles all aimed menacingly westward from Russia. The pattern has continued. The Intercept reported in September 2016 on “a major push by military contractors to position Moscow as a potent enemy that must be countered….”. US plans to increase weapons exports as a percentage of its total sales also include increasing sales to the Middle East. In January 2015, Lockheed Martin CEO Marillyn Hewson suggested to investors that continued “volatility” in the Middle East and Asia made the regions “growth areas” for the firm. In April 2015, The New York Times described the militarisation of the region as “a boom for American defense contractors looking for foreign business in an era of shrinking Pentagon budgets…”. For the merchants of death, war is simply a business opportunity; but it is one built upon millions of shattered lives. Jobs: how many and at what cost? For Turnbull, as he seeks to normalise and sanitise the notion of war profiteering, it’s all about jobs. Absent though are the figures demonstrating that weapons projects create more jobs than the same investment in other sectors. The figures don’t exist. However, evidence from elsewhere indicates that clean energy, health care and education rate far better than building weapons. The weapons industry is one of the most corrupt, least accountable and most secretive of all industries. Decisions on sales are hidden behind the standard ‘commercial-in-confidence’ or ‘national security’ arguments. In Senate estimates last year, Defence Minister Marise Payne refused to provide information on Australian arms sales to Saudi Arabia when questioned by former Greens Senator Scott Ludlam. Information on what weapons Australia sells where has consistently been denied to citizens who ask (as the Medical Association for Prevention of War and others have attempted). In addition, notions of who is an ‘expert’ in the matter of defending Australia, along with decisions on weapons exports, have become skewed towards those with technical knowledge of killing machines and away from those with knowledge and experience of diplomacy, peaceful conflict resolution and how to avoid tensions in the first place. The decision to militarise its exports fits with the militarisation of Australia’s foreign policy generally. Our overseas aid, which could be a powerful force for building good relations, has been slashed to unprecedentedly low levels. Our huge potential for leading the world in renewable energies has been ignored in favour of an attempt to join the big players in fuelling current and future wars. The decision is ill-advised and will be fraught with strategic and ethical dilemmas. Dr Sue Wareham is the president of the Medical Association for Prevention of War (Australia). This article was first published on the Australian Institute of International Affairs website under Creative Commons Licence and may be republished with attribution.